Where to find Centova Cast? Press “View Details” on the service you want to log into. Press “Log in to Centova Cast” and there you go! Please note The statistics you can see on that page are only updated every 24 hours − so, don’t be surprised if it does not match your current limits. Welcome to the SHOUTca.st family! New to Centova Cast? Don't worry we all were once! First of all we have to find it, this can help you a lot! The first question I have to ask is if you want to use the AutoDJ or not? First I'll explain on how to broadcast live only: First make sure your server is turned on: Then go to "Quick Links" and use the details under "autoDJ is not running" to connect: That's all folks! Happy Streaming! If you want to use the AutoDJ, pick up here! First make sure it is enabled, you can find instructions on that here. While we are in settings you can change some basic settings Under Stream: Don't forget your genre under AutoDJ: Some servers might also require your stream name to be changed under Mount Points: Press update and there we go! Okay now our settings are correct we can go on. First of all we have to upload songs! 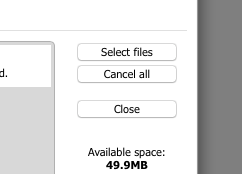 Open "Files" If you prefer FTP, those details are under "Quick Links". 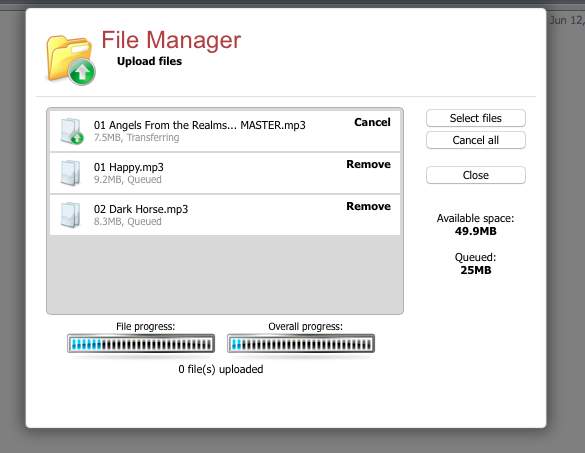 Make sure you are in the folder "Media" Press upload: Select your files: And wait till it is finished... Now this is done we can close the upload dialog and press return to go back. Now we need to go to Media to add the songs to our playlists: Select the songs you like and drag them to one of the playlists on the left hand side. By default we have 3 rotations, the more heavy the more it will play that song. Press return and prepare for the magic moment! Press start and there we go! Got your broadcasting software and you are ready to go live? Then you probably need the details to connect. Finding them in Centova Cast is pretty simple! Once logged in, you can find all these details under "Quick Links". First of all the connection details are different depending on whether AutoDJ is turned on or off. My AutoDJ is turned off. You can find your info under the "Use this if you do not use the AutoDJ" part. 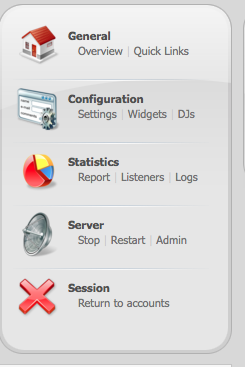 Please note that DJ accounts will not work for you as the AutoDJ system is turned off. Make sure you are using the source password, which is different from the admin password (used to log in to the control panel) by default. My AutoDJ is turned on. 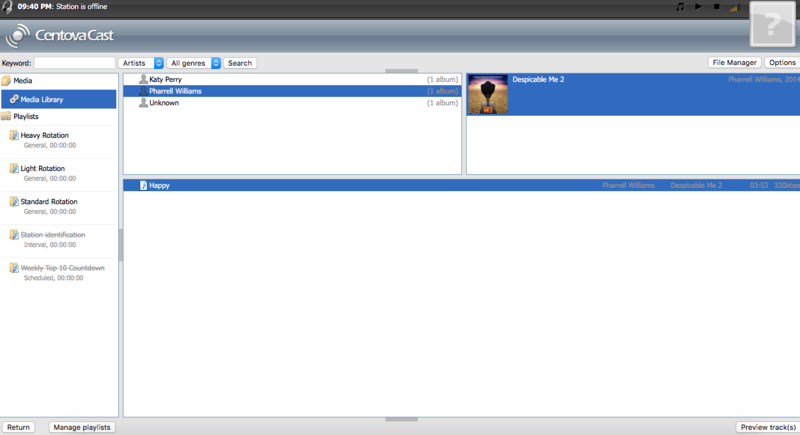 When using the AutoDJ system, you need to create a DJ account first; this is an individual account for each DJ. You can permit them to broadcast on certain times and give them limited access to Centova Cast. To connect the DJ, do NOT turn off the AutoDJ, the system will do that for you. Just make sure to use the first details listed on the "Quick Links" page. First of all, make sure the password is correct and in the correct format. Also make sure that the DJ is allowed to go live on the current time. If that does not work, please try to restart your server. If it still won't work, feel free to opeen a ticket so we can have a look for you. Is the AutoDJ missing in the menu? It is probably just turned off. In this guide I'll explain on how to turn in on in a few simple steps. Make sure the server is turned off You can do that by pressing stop. We're done! 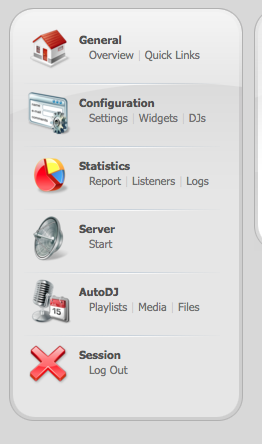 The AutoDJ is now visible in the menu. Forgot your Centova Cast password? Forgot your Centova Cast password? No problem! 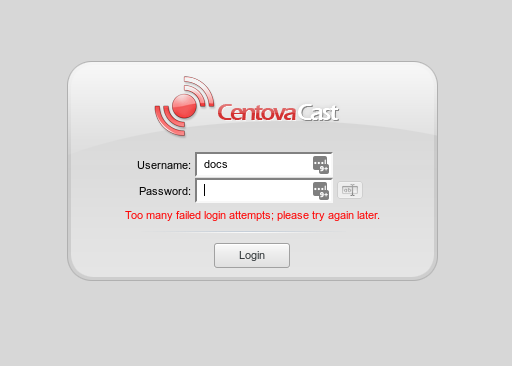 Centova Cast has a security feature that it will block your IP for one hour after too many failed login attempts. If this is the case you will see the error message: "Too many failed login attempts; please try again later."